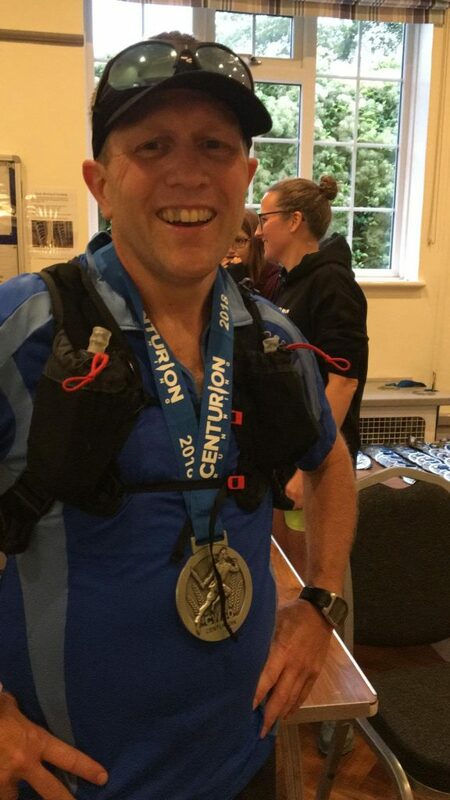 Liverpool to Manchester seemed like a distant memory but onward towards the Centurion Running Chiltern Wonderland 50 mile race on Saturday 15th September. Following the failure of the Green Sand Ridge solo attempt at 33km due to complete stupidity and nutrition/water issues, my training had taken a different pathway this time with more short efforts but intense training, including hill reps on bike of Ivy Lane and a boot camp in the Lake District to really work the stamina I needed. CW50 starts at Goring near Henley and takes in some amazing parts of the Thames path and the Chilterns Way extension including Cobstone Windmill at Turville hill that featured as the home of Caractacus Potts in the film Chitty Chitty BangBang, climbing to Christmas common then dropping to the infamous Grim’s Ditch. The course notes say steep inclines on the first part of the course but failed to mention the long, slow, dragging-on-forever ones in the second part. Overall 1564m of climbing so not exactly flat. Normal issues a week before race including deathly man flu, aches and pains with the decision to run only made 3 days before after a test run to check out that my head and lungs worked. Race day – arrive early and park car (great things about ultras is how close you can park to the start) register, go to toilet multiple times, panic something isn’t right, pre-race briefing and then off to start line for 9am go. Weather was meant to be overcast and below 20°C. That was the first part of the day that was wrong as the sun baked us until about 4pm and the temp hit well over 20. Hooter goes and off and a very slow start to the race as the Thames path at Goring is quite narrow and it took some time for the field to filter out. Once it spread at the first open meadow I got into a pace that I was happy with until we hit the first hill. Now when I say hill I mean small bump compared to the rest of the course. The run to the first checkpoint 10 miles is relatively fast with a few small humps and bumps. I sensibly didn’t do my normal nuttiness and actually stayed within target pace even walking some hills early on to conserve energy. Small stop at checkpoint to get on board liquids which were draining at a rapid rate from my reserves and some early food intake. Next checkpoint 8 miles further on was a bit more testing with some big hill elevations but not much down so slogged away to keep within pace, legs and body feeling good. Some chatting on the way to some ultra-veterans. Quick food stock-up at the checkpoint but it was obvious the temperature was rising. Didn’t have my normal desire to stuff sausage rolls in and had to aim for jam in wraps and ham sandwiches to get some calories in topped up with my concentrated fruit bars. The route from checkpoint 2 – 3 see the steepest inclines of the course with the crawl (yes I mean crawl) up chitty chitty bang bang hill that really slowed the pace down and also the start of some sickness issues. Started to feel like I did at Greensands and temperatures had started to rise more than expected and the sun was beating down. Onto my first mistake after the hill as I missed a direction arrow and although I only went wrong for 100m it gave me a wake-up call that my concentration was going. Gladly CP 3 came up at 26 miles and made it at 4hr 30 so pretty happy but feeling very rough. Food tactic changed and decided to have tailwind in the water and food switched to watermelon, pineapple and coke plus the babybels I was carrying to try and make me feel less sick. CP 3-4 were horrendous and really struggled on the long slow inclines, feeling very sick and light headed, taking a big stumble and smashing the knee and misjudging where I was on the 8-mile section (phone had messed up distance and watch had died). This meant that I stupidly went through my water 2km before the checkpoint and was really suffering by CP4 as it came at the end of another slow climb. This was time for some serious talking to myself, got the watermelon, Pineapple and Doritos on board, water and stocked up my hydration. Started to feel much better and pushed on by the amazing volunteers I left for the next 7.9miles. Another long slow climb before we finally hit Grim’s ditch which is 4km of long slow down hill on rough trails through a tree lined avenue. My pace had dropped quite a lot before this but with some break at last in the uphill sections I got my second wind and flew down the ditch to checkpoint 5 meaning 9.1 miles to go. Stocking up again on what I knew was sitting ok I headed off knowing I wanted to get home before the gloom set in through the final wooded sections. The next 3 miles were very much up and down and by then was joined by 3 other runners which was a godsend as we crawled up another hill to come to a very long downhill section. Working together we cracked off some serious pace until another small incline with 4 miles left. One of the group went off up the hill leaving 3 of us to work away the final 3 miles mainly down-hill to the finish. With the mind switching off again I manage to smash my foot into a hidden tree root causing me to stub my toe in the woods it didn’t feel good (post-race it is now very black and blue) but onwards the pace kept up, then down went another member of the group in front of us, so we picked her up and dusted her off. Onto the edge of Goring with 1 mile to go, we had put in such a pace that our predicted 10 hr finish time at CP 5 had become 9.45 (the last 5km was done in about 25 minutes). A small loop of the village before we arrived at the village hall and the awaiting crowds and a timer that stopped at 9hrs 42 and 55th place. David shows off his bling! A few minutes over my PB but overall a much more controlled run than my DNF efforts at WW50 and GSR and much more enjoyable than L2M. Emotional, but in one piece apart from a few bruises and a very nasty looking toe and mind set on the next target in November. All club members are encouraged to attend these joint sessions. They offer an opportunity to train on the track and do field events in a more official setting. The Beds County Championships for Track & Field will be held on Saturday 11 May. As long as you qualify to race for Bedfordshire, you are welcome to enter any of the events on this day.